Diversity in the workplace involves more than just race. Education, religious views, and age represent some of the many facets of diversity. Implementing a diversity initiative in your office can help your employees respect the different backgrounds and experiences each individual brings to the workplace–otherwise known as cultural competence. Organizations with high workplace diversity often exhibit increased creativity and problem solving. Diverse values, skills, and experiences lead to different ideas. The more ideas there are, the easier it is to find the right solution. 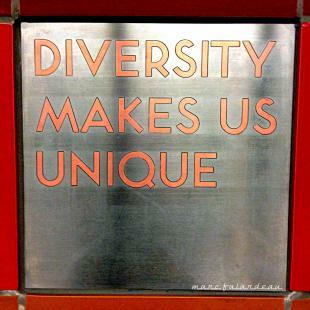 Additionally, organizations that embrace diversity are more open to change and can adapt and respond to client needs. Diversity initiatives can lead to not only improved customer service and problem-solving, but often result in increased employee productivity as well. What is a diversity initiative? Diversity initiatives are often confused with affirmative action (representation of certain groups of people) and Equal Opportunity Employment (laws and requirements that prohibit workplace discrimination). However, affirmative action and EEO are mandated by law whereas diversity initiatives are not. The most successful diversity education programs are instituted across the entire company–every department and employee should be committed to the program. There should be a specific goals that are measurable and tied to the company’s overall business strategy. Many diversity initiatives focus on recruitment, general employee training and sales or marketing efforts. Awareness of your own worldview: How conscious are you of your own prejudices? It is often hard for us to spot our own biases, but diversity education can help expose personal prejudices. Your attitude towards cultural differences: How do you react towards people of backgrounds different than yours? What is your ability to adapt your views of other people and other cultures? Role playing and scenarios are a good way to break down these biases and open discussion with others. Your knowledge of different cultures: The more knowledgeable you are about other people and cultures, the less likely you are to say something offensive. Furthermore, cultural knowledge can help with problem solving, management roles, traveling, and more. This may manifest as a monthly gathering for employees to share and celebrate each other’s cultures and traditions in a respectful way. Cross-cultural skills: Skills refer to the ability to navigate interactions with others. This means being aware of your communication style–your vernacular, tone and even speed. A turn-of-phrase used around your office in the U.S. could potentially offend a client overseas. What sort of words do I use when talking about others? Are you stereotyping without realizing it? How do you characterize others or groups of people? What tone do you use when you speak to others? How does that tone change from person to person? Do you consistently find yourself getting frustrated with a certain age group, ethnicity, nationality or gender? What conclusions do I draw about others during conversations? What assumptions are you making and why? You can also use online training to further your education. The “Just Be F.A.I.R” course by Sollah teaches the importance of a diverse workplace and explains how to use that awareness to foster an accepting and efficient work environment. For an introduction to cultural competency, check out Goldfinch’s “Basic Cultural Competency” course.